EVENT: The 22nd Annual Fishermen’s Fall Festival sponsored by the Fishermen’s Terminal Tenant’s Association. All proceeds directly benefit the Seattle Fishermen’s Memorial and their efforts to honor the local fishing community and their families. PLACE: On the Boardwalk of Fishermen’s Terminal, 1900 West Nickerson Street, Seattle. PURPOSE: Provide the public with an opportunity to meet commercial fishermen and learn more about their industry, which is a vital part of the economy of the Greater Puget Sound Region. Provide an opportunity for the public to come to Fishermen’s Terminal and experience its unique character as the home base of the North Pacific fishing fleet. Provide an opportunity to educate and interest the public in seafood. Information is provided on everything from how it is caught to how to prepare it at home. Provide an opportunity to celebrate the return of the North Pacific Fishing fleet to its home base at Fishermen’s Terminal. 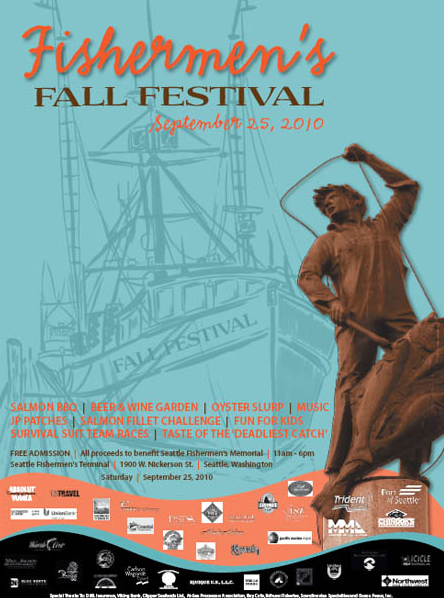 Provides a fundraising opportunity benefiting the efforts of the Seattle Fishermen’s Memorial. 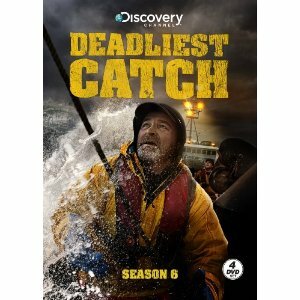 F/V Wizard Captain Keith Colburn and additional stars of the Discovery Channel’s “Deadliest Catch” will help raise money for the Fishermen’s Memorial by shucking crab and signing autographs in the Deadliest Catch Seafood Booth. The freshly shucked crab will be used in a scrumptious Deadliest Catch Crab Cocktail, the sales of which directly benefit the memorial. Cooked by members of the local fishing community, all proceeds will benefit the Seattle Fishermen’s Memorial – Salmon Meal $10.00 and Hot Dogs $5.00. Each meal includes a beverage and dessert, with the salmon meal also offering guests fresh corn-on-the-cob (the salmon is generously donated by Trident Seafoods). New to the festival is the Deadliest Catch Fresh Crab Cocktail $10.00, which is freshly shucked at the festival by stars of the Discovery Channel’s “Deadliest Catch” (the crab is generously donated by the Alaska Bering Sea Crabbers). Another new delicacy is “Scalloritos”, which are Alaska weathervane scallops wrapped in bacon served with tortilla chips and salsa in a soft tortilla (scallops kindly donated by the Alaska Scallop Association). Kids of all ages are invited to participate in activity booths including Miniature Wooden Boat Building, Fish Prints, Oyster Art, Creation Station, Have Art We’ll Travel, Spin Art, Balloon Sculptors, Trout Pond, Mutiny on the Bouncer and more. Upbeat, spirited works by local artists are featured at the event. Inochi Taiko: Kicking off the festival, these traditional Japanese drummers are a local “You Tube” hit and are certain to be fun for all ages! Knut Bell: Performing American/alternative county originals, this live local band is sure to entertain. Guests are invited to join while Anthony’s Regional Chef Randy Bergau and Jon Speltz of Wild Salmon Seafood Market demonstrate salmon and halibut filleting on the Seafood Demonstration stage. The opening performance on the Demonstration Stage, guests will learn how to fillet from the professionals while celebrating the local fishing community. At 3:00 p.m. guests are invited to watch a riveting survival suit race, beginning at the west wall. During the race local fishermen and women will don their survival suits to see who will take the gold in a race to the finish. The popular wild salmon fillet challenge returns to the Seafood Demonstration Stage at 1:00 p.m. During the event each competitor will fillet two salmon and will be judged on speed, recovery and the quality of the filleted fish. Local oyster lovers are invited compete to consume 10 oysters on the half shell with no hands; what promises to be a riveting oyster slurp competition. A centuries-old delicacy, lutefisk is a traditional Norwegian Yuletide meal consisting of cod soaked in lye. The first 10 competitors to sign up for this competition will begin in round one to see who can consume a quarter of a pound of the lutefisk in the shortest amount of time. The first five competitors to finish their portions of this delicacy will move onto round two where they will again be challenged to eat another quarter pound of lutefisk. The first three to clean their plates will move onto round three where they will consume yet another quarter pound of lutefisk. The first two iron-bellied contestants to clear their plates will move onto the fourth and final round where they will compete for the top prize. Continuing from 11:00 a.m. to 6:00 p.m. the Sea Explorer Scout ships will be open to the public! The Nordic Heritage Museum’s boat, the Nordic Spirit, which is a replica of a 1909 Viking vessel will be on display at the festival! A U.S. Coast Guard helicopter will perform an aerial rescue demonstration.